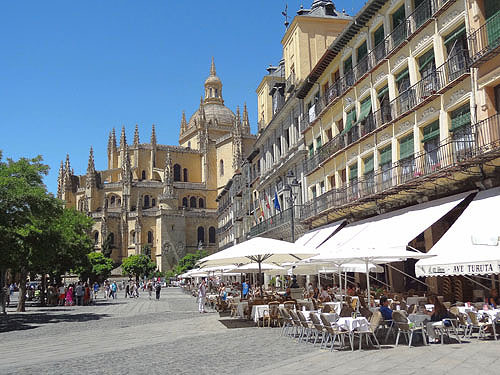 In Madrid a week ago, we took a tour out to Segovia, a charming town only a 1½ hour drive north of the capital. The town is famous not only for it’s 2,000 year-old Roman aqueduct, the largest and best preserved from the Roman Empire, but also for its castle, or alcázar, which along with Neuschwanstein in Bavaria, inspired Disney’s design of Cinderella’s castle in Disneyland. We traveled there in a small 14-person bus, arriving about two hours before lunch. Our guide asked if we wanted to first go up to the castle since from there we could walk down through the town to the aqueduct and our restaurant which was right below it. 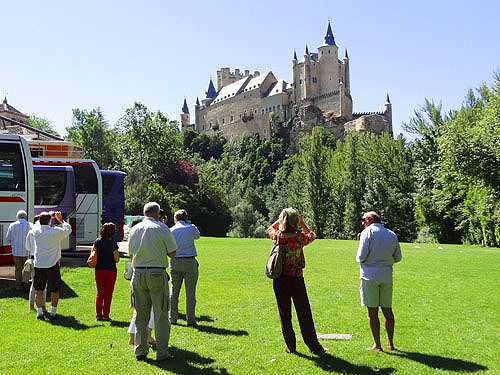 We all agreed, of course, but what she had neglected to tell us that buses, regardless of size, were not allowed up to the Castle so we would have to climb a steep zigzagging stone staircase up the hillside to the Castle. It was an unexpected bit of exercise but it was also a beautiful walk through the woods where brightly colored poppies bloomed along the way. When we got to the top a couple of people from our group wanted to climb up the tower, which, after the climb up the hillside, was absolutely of no interest to me. Most of us opted to view the castle from the outside, then take a leisurely walk through town and then meet at the restaurant in an hour or so. 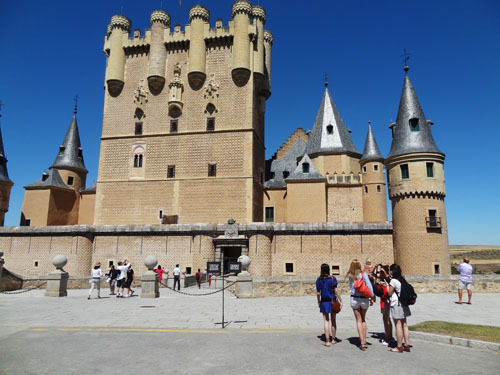 It turned out to be the best option since Segovia is a lovely old town and we had a great time just ambling along, poking in here and there to our heart’s content. 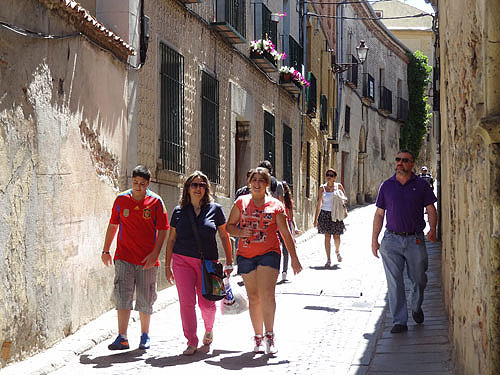 From the castle we set out along Calle de Daoiz, a pedestrian lane lined with little shops, galleries and restaurants. Although we were there on a Saturday, I was surprised that it wasn’t more crowded with tourists. We stopped in several shops and a gallery or two and when the street emptied into the town square right past the cathedral I was bowled over by the sight. It was one of the most comfortable little squares I’d seen in any small town. 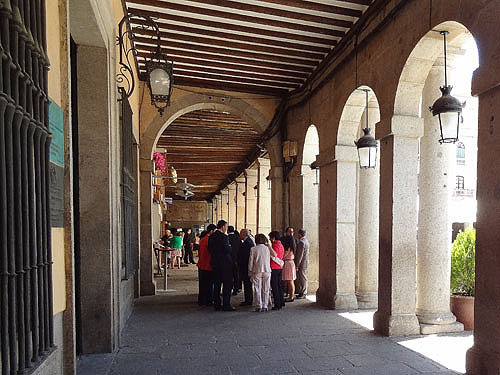 A colonnade on one side of the square was lined with restaurants and outdoor cafés, and people were either finishing their late breakfast or gathering for lunch under canopies of umbrellas. One large family group was all dressed up and I guessed they had come from a christening in the cathedral. 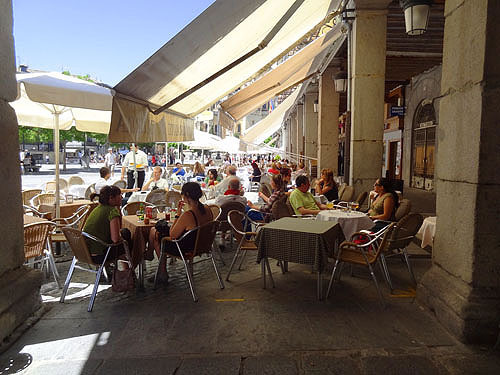 The men stood over by a restaurant entrance talking while sipping their beers and coffees, while the women gathered around the tables beneath the umbrellas. It was the kind of place where you wanted to sit for hours, just sipping a beer or wine and watching the passing parade. 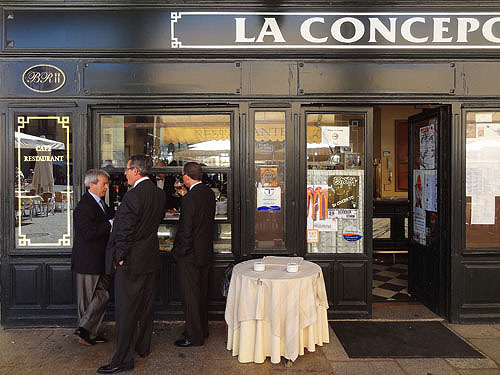 Walking down the colonnade we passed, La Oja Blanca, a restaurant with its name written above its door. A few minutes later my wife Marjorie, who speaks Spanish, commented that she couldn’t understand the literal translation of the restaurant name, since she was unfamiliar with the word “Oja,” so we decided to go back and ask. We asked several of the waiters and waitresses outside about the meaning but with no luck, so we went inside and asked the woman behind the counter bar. 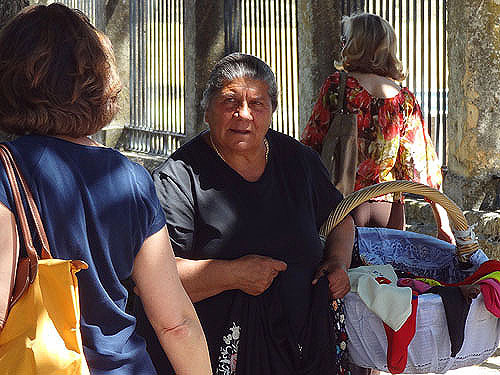 She told us the name referred to a poem about a woman with a glass eye, which was written by a local poet who once lived in a house over near the Cathedral. To me it seemed like an odd subject for a poem, but with our little mystery solved we continued on our way towards the aqueduct and the restaurant. The crowd slowly began to thicken as restaurants and stores along the way became more numerous. After a few minutes we reached an even larger square and saw the magnificent aqueduct looming over it. 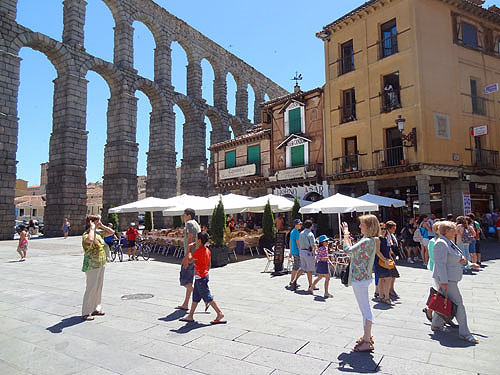 I remember having seen the Roman aqueduct in Salamanca years ago, but it seemed dwarfed compared to the enormous 95-foot-high structure in Segovia, which, despite its age, still appeared to be in perfect condition. And right next to it was our restaurant, 100+ year-old Candido, occupying what appeared to be the prime piece of real estate in town. 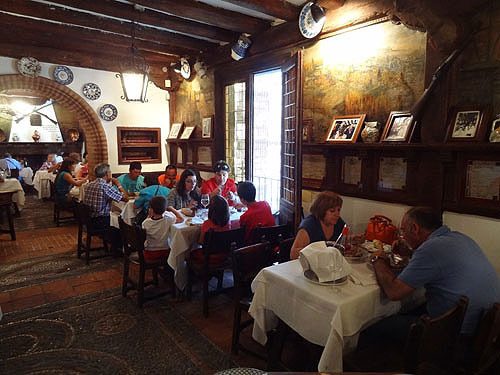 Candido, we quickly realized, is as famous for its suckling pig and lamb as it is for its ambiance. It’s old plaster walls, beamed ceilings and narrow, worn-stone stairway take you back a century or more as it has for celebs ranging from Hemmingway to Nixon. Although our waiter had told us that the suckling pig is actually cut with a plate, we were all still surprised later on when the pig was brought out. It was quickly followed by the owner of the restaurant who then cut the pig into sections by driving down into it with a dinner plate. He then smashed plate on the stone floor to the applause of everyone in the room. 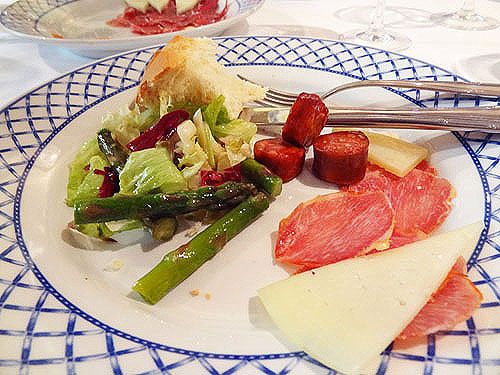 The smashing of the plate was totally unexpected and for a moment I thought I was back in a taverna in old Athens. But once we stepped out the door of the restaurant and looked up at that incredible aqueduct, there was no mistaking that the origins of all of this were definitely Roman inspired. Hi Jim! very well writen article! However, you did miss going up to top of the tower, the views are incredible. Really it is worth the view up there (apart from the stone staircase path which takes you there). I understand though being tired after the other walk. Maybe you can get also pics from somebody from your group who did go to the top. Very nice article in any case! I’m glad your enjoyed the article. During my next trip I’ll be sure to climb the Tower!